Another Trade Deadline has come and gone, its significance not to be fully comprehended for many years to come. However, while most everybody remembers the particulars from the most infamous Deadline deals, your Matteau/Amontes, few recall the general managers, the traders who jockeyed with each other in the pit. The better GMs live to fight another Deadline; the worst ones usually weed themselves out quickly. Occasionally, however, an especially incompetent trader lasts long enough to create a true corpse of work. When it comes to trades, you win some, you lose some. Here are the men who pretty much lost them all. 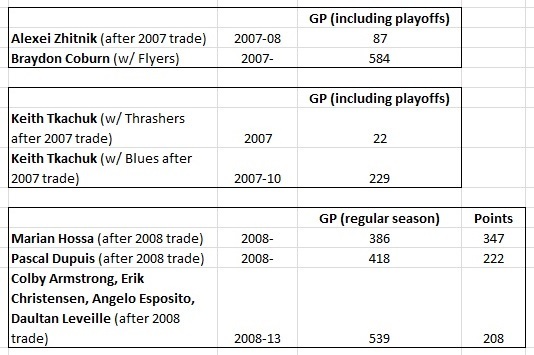 The worst Trade Deadline GMs ever. Dishonorable Mention Ron Caron was St. Louis Blues GM from 1983-94 and 1996-97. Perhaps the mercurial Caron was a Canadian double agent? “When he shipped players like Joey Mullen, Doug Gilmour, Rick Wamsley and Rob Ramage to Calgary, Caron was accused of running a Flames’ farm club and helping mould their Stanley Cup champion team.” He also placed a third of the regulars (Brown, Hedican, Lafayette, Courtnall, Momesso, Ronning) on the 1993-94 Vancouver Canucks Stanley Cup Finalist. And what did the Blues bring back? Scorer Eddy Beers, whose career was cut short by back injury. A couple seasons from veteran physical defender Garth Butcher. And Craig Janney. Twice. All adding up to one fluke Conference Finals appearance during Caron’s stewardship. Caron’s Trade Deadline record is redeemed solely by stealing Brett Hull from the Flames in 1988. George Maguire was Los Angeles Kings GM from 1977-84. It was the deal that “may have started the deadline craze 34 years ago.” The proof that such buzzer-beater swaps could indeed propel your squad to glory. Or more exactly, in the case of Butch Goring and the New York Islanders, four consecutive Stanley Cups. But this article isn’t about winners. It’s about George Maguire. For this valuable final puzzle piece of New York’s dynasty, the Kings received steady defenseman Dave Lewis, who captained the team for two years, and Billy Harris, a strong, two-way winger who managed parts of three non-descript seasons in Forum blue and gold. Nevertheless, it’s not as if Goring was going to win anything in LA. The Deadline deals that cement Maguire’s well-deserved reputation as being one of the worst general managers in NHL history was the chucking of future first-round picks for washed-up veterans. Four games from Rick Martin before he retired? A couple decent seasons from then-31-year-old defender Jerry Korab? Can you imagine how HFBoards 1980 would have coped with these exchanges? Of course, knowing Maguire, instead of a Phil Housley or Tom Barrasso, the Kings would’ve drafted Bryan Trottier’s brother Rocky. Don Waddell was Atlanta Thrashers GM from 1999-2010. Aside from ownership issues, Don Waddell is the main reason why hockey failed in Atlanta. Given over a decade to build a winner that might excite a city which was historically cool to hockey, this master of asset mismanagement failed over and over again. Consider the Trade Deadline his favorite canvas. While ultimately short-sighted Deadline moves to snap up vets like Alexei Zhitnik and Keith Tkachuk for a playoff push are defensible, even if they resulted in a 2007 first-round playoff sweep, Waddell’s true “Ode to Inepitude” was what he pulled in return for the three stars of the franchise’s lone playoff appearance: Johnny Oduya. The only player Atlanta plucked in respective deals for Marian Hossa, Ilya Kovalchuk, and Kari Lehtonen who’s still taking a regular NHL shift anywhere, Oduya played just parts of three seasons with Atlanta/Winnipeg before being tossed to the Chicago Blackhawks, where of course, he emerged as an integral part of 2013’s Cup winner. And the now-Jets could sure use Lehtonen between the pipes over Ondrej Pavelec. Well, at least the oft-injured but supremely talented goalie eventually brought back Andrew Ladd (through Vishnevskiy). And no, Waddell did not make that deal.